Existing vaccines for allergies involve three to five years of regular injections with increasing amounts of allergen... All the while the immune response slowly changes from a predominance of T-helper 2 (TH2) cells, immune cells responsible for triggering allergic reactions, to T-helper 1 (TH1) cells, which stimulate the production of protective antibodies. Because nothing is directing allergens to the right place in immune cells, it takes a lot of allergen to generate a response. The new vaccine is structured to deliver the allergens/antigens to the right places. "[Components in the new vaccine] lower the dose needed to induce a T-cell response by a factor of about 100," says Reto Crameri of SAIF, lead author of the study. I thought that, if you wanted to set the icon for a non-application file in OS X, you had to go through a convoluted process that involved copying the icon from another document. But it turns out you can just compose your icon with your favorite graphics tools, then copy and paste it into place. 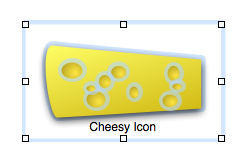 Draw the icon graphics in OmniGraffle. 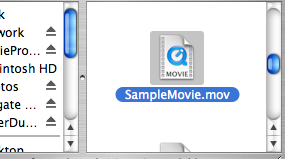 Select the QuickTime movie file. Select the document icon in the top left of the info window. Paste in the new imagery (Command-V). ...those vaccine-induced antibodies do not recognise the Fujian virus, although they do attack the virus strains that Fujian has now replaced. This means the Fujian strain has a selective advantage in vaccinated birds. "This novel variant may have become dominant because it was not as easily affected as other strains by the current avian vaccine," says Guan. That may also be why H5N1 infection in Chinese poultry has surged, rather than decreased, despite increased poultry vaccination. Worryingly, the antibodies being used to develop human vaccines for H5N1 ... do not recognise the Fujian strain. This means the current experimental pandemic vaccine would not work against any pandemic virus that emerged equipped with Fujian surface proteins. In the face of mutating pathogens it's easy to see why monitoring and quarantine are favored weapons against epidemics. 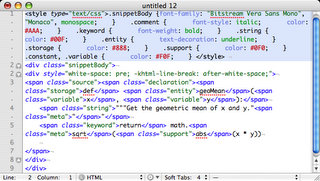 I just switched to Firefox 2.0 as my default browser under Mac OS X. When a friend emailed a link to a PDF document, I clicked it as usual. 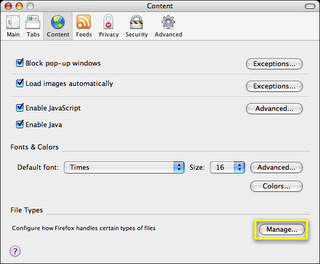 Out of the box Firefox, unlike Safari, cannot view PDFs inline. That's okay, I really just want it to open it in Preview. Alas, that's not an option. 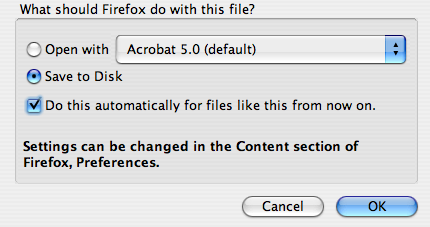 Firefox gives me the choice of saving to disk or of opening with Adobe Acrobat. I searched through the files in my Firefox profile directory. There were no direct references to Acrobat. According to macosx.com the fault lies outside of Firefox. 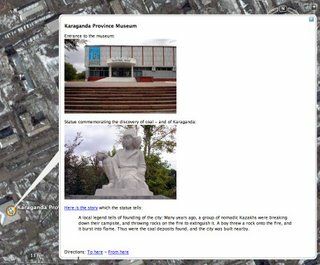 The thread suggests using Finder Info to make Preview.app the default viewer for all PDF documents. The suggestion did not work for one of the thread participants, and it doesn't work for me, either. Preview.app is already set as my default for all PDF documents. Unfortunately that's a binary property list file and even property list editor can't display its content in a human-intelligible way. I closed Firefox, moved ~/Library/Preferences/com.apple.internetconfig.plist out of the way, and followed my friend's link again. This time Firefox let me choose between saving to disk and opening with Preview.app. Interestingly, Firefox did not create a new copy of the plist file for me. A less radical solution also works: when Firefox asks how you want to handle the PDF, tell it to save to disk. 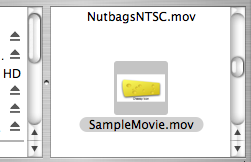 Also select the checkbox labeled "Do this automatically for files of this type from now on." 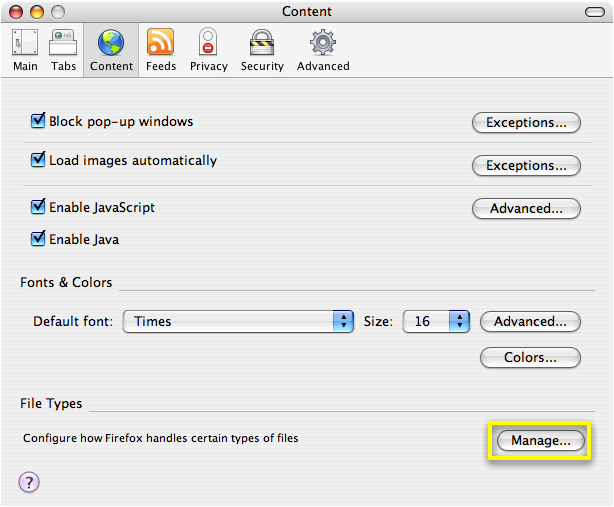 After downloading, open Firefox Preferences, switch to the Content pane, and click the "Manage..." button at bottom right. The list should now contain an entry for PDF. 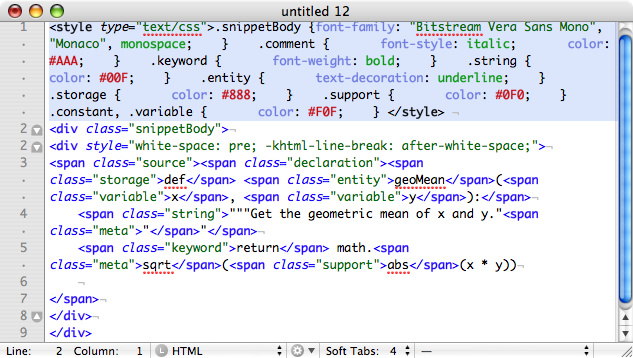 Select it, edit, and change to open with a different application than the default.